The journey as a child star in Singapore and later TV personality and entrepreneur. Firstly Rilla, I am so sure our readers would love to know who Rilla Melati is. Can you help us walk back a little to when you first started; your journey as a child star in Singapore and later TV personality and entrepreneur? I was introduced to the world of television at 2 years old when TV was still in black and white. This was in the 70s when Mediacorp was known as RTS (Radio Television Singapore) and pre-dated Mat Yoyo. The Malay entertainment department had a Children’s Television Workshop wing. They engaged my father, who was a Malay language and music teacher to write scripts and compose children’s songs for their TV programmes. That was how I got roped in. Subsequently, I was trained to read scripts, memorise and take instructions. I also had to go through classes in acting, singing and dancing and was trained under the best teachers of that era, like Singapore’s living national treasure and Cultural Medallion award Nona Asiah. I spent 90% of my childhood at RTS. The TV studio became my classroom. So by the time I eventually entered mainstream school, it was a breeze. As a 7-year-old, I could read, write, perform in concerts and even helped my teachers choreographed many dance items for our school shows! My involvement with TV continued into adulthood moving in tandem with my education and my life. For example, when I went to the university I started appearing in programmes that would also require me to be part of the production team hence, expanding my work responsibilities. When I got married and was pregnant with Nadim, I did less work in front of the camera and started writing scripts for various production houses. This gave me the opportunity to hone my writing skills and until today, I can write in many different genres – children’s drama, info-ed programmes, entertainment shows and even documentaries. As time passed I was given more challenging roles and before I knew it, I was anchoring many many shows on primetime slots, eventually hosting my own talk show Rudy & Rilla for six seasons and going on to win many awards at the Pesta Perdana. A total of 6 awards, 5 of which are for Best Presenter which was won consecutively. Altogether, I have 44 years of TV experience out of 46 years of my life. Television has been the longest part-time career ever for me! Like every other sensible Singaporean, I took on a stable job upon graduating from university. My parents wanted me to become a teacher but I refused. After moving from one state board to another, I knew that I needed to strike it out on my own. Being an entrepreneur is a culmination of all that I’ve gathered from growing up in the TV studio, the corporate experience I went through working for people as well as my own childhood – watching my father create content for kid’s TV as well as being a writer of children’s storybooks and Malay assessment books alongside being a full-time school teacher. He was such an inspiration and an integral part of my childhood; the one who exposed me to the process of bookmaking. As a child, I used to follow him to all his meetings with book publishers and sat in with him when he spoke to his editors. But it wasn’t until the year 2000 that I finally set up a company with a partner called Stagehandz. It offered educational roadshows, drama as well as NE workshops to schools in Singapore. I was home-based and functioning from my bedroom in my house for the first two years until my divorced happened when I and my business partner at that time decided it was time for us to have our own office space. This also coincided with our venture in 2003 when we opened an enrichment centre at the Esplanade called ACTphabets. During this time, I saw a gap – the need to provide for good quality Malay programmes to children who were struggling with their Mother Tongue. So I started doing the syllabus and the programme for that and offering it to schools as well as a staple in ACTphabets. I did not have anything to benchmark on. Unlike Mandarin where available resources were aplenty, there were no available ready-made materials in Malay, for children, for me to work on. I had to start everything from scratch. Alas, the programmes took off but it could not sustain. The take-up rate was too small and the numbers were just not picking up for these Malay programmes at ACTphabets although the school-based ones were slowly picking up steam. All this while going through a divorce and working out to re-build my life again. Eventually, I decided to leave Stagehandz-ACTphabets in 2007 and that partnership ended. I was a young divorcee with a baby in tow and a career that got halted. But I would say, this was the turning point where I truly became an entrepreneur. Because looking back, I now know that the reason why it did not work out with ACTphabets, amongst other things, was because I was too ahead of my time. I had a product that did not meet the day’s need. Yes I saw a problem, yes I saw a gap, yes I had the solution, but I missed a crucial point – the community whom I thought needed it, did not URGENTLY need it yet. So if you ask me today, what is my definition of an entrepreneur, I would say – entrepreneurs are visionaries who do not know that they are visionaries until somebody tells them! In my case, it took a few good friends and a new business partner in the form of Najip Ali, Asia’s foremost entertainer/producer to give me a turnaround in pursuing what I really wanted to do. So in 2009 armed with two manuscripts of a children’s book and a business model that needed re-working and fine-tuning, I teamed up with Najip Ali and started Mini Monsters. We seeded the company from Najip’s production house DuaM and during its baby years, Mini Monsters was the educational arm of DuaM’s TV production business, amalgamating its founders’ strengths and expertise – entertainment and education, hence our motto “Berhibur dan Belajar”. How has 2019 been personally and for Mini Monsters? Well, to be honest, the year did not start with a bang for me personally. My health was not very good at the end of 2018 and it carried through to the early parts of 2019. So that was not good. But, fortunately, that wasn’t the case for Mini Monsters. 2019 is a very special year for us. It’s our 10th anniversary! We welcomed the addition of a new staff member and opened a new wing within the company – Mini Uni! We are also launching something very exciting in the third quarter of this year – our very own online bilingual kids channel called MonstarsTV! Mini Monsters is such an interesting concept in instilling the love of Bahasa Melayu to our kids in Singapore. What started it; what gives you the idea? As mentioned earlier, Mini Monsters amalgamates the concept of entertainment and education – “Berhibur dan Belajar”. Both I and Najip saw the need to fill the gap – children were not speaking Malay and parents were at a loss in finding locally made educational resources in Malay. For decades, Singaporean Malays have been overly dependent on Malaysian books and Malaysian educational products but we know that most times, things bought from across the causeway do not resonate with the sensibility of the children here, the English speaking urban Malays who are learning Malay as a second language. Both me and Najip wanted to innovate. We realised through our interaction with children, that Malay kids learn differently. They are aesthetically heightened, excelling in the arts – singing, dancing, acting, those things. So, we understood that they needed to be entertained first before any kinds of learning can take place. Berhibur and then belajar! Yes, in that order. 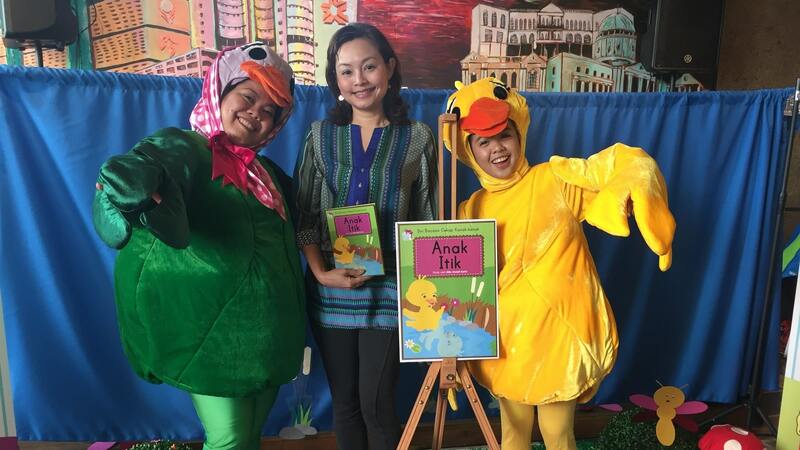 We wanted Malay children to re-learn the Malay language through a fun and entertaining way so that they can re-learn to love the language all over again. We also wanted to develop educational resources and storybooks that could be used in class for children and teachers because for decades, either these materials were non-existent or they have always been imported from Malaysia. We partnered many people and my dad has been the backbone in lending his language expertise and teaching experience in co-developing many of Mini Monster’s products. In short, we wanted to bring back a love for the mother tongue and customise it the Singapore Malay way, with Singaporean sensibilities that are relevant to this generation of bilingual learners. Now that Mini Monsters is independent and is no longer under the umbrella of DuaM Pte Ltd, that spirit still prevails and we have continued to make our content as current and relevant as possible for the children. What are the courses or workshops available and how are they conducted? Mini Monsters run language-related courses in schools all over Singapore across the different levels, from pre-school to primary to secondary and tertiary levels. The courses range from Malay speech and drama classes to Malay creative writing courses as well as the literary arts programme where students learn Malay through locally composed children songs that were written over 40 years in Singapore. In addition, we also have courses for the public. Our weekly enrichment classes for children aged 4-12 comes under Mini Uni and they are conducted at our very own HQ in Jln Pemimpin. Our star products under the Mini Uni banner is Fonik Ria Cepat Membaca – a licensed and comprehensive Malay phonics reading programme that you cannot find anywhere else in Singapore and Easy Malay – a conversational Malay programme specially designed for children who want to learn Malay as a third language. Our approach is very interactive. We amalgamate drama, song and dance in language learning. All of our programmes, be it at Mini Uni or for the schools, engage children in an entertaining manner. All of these songs and creative content are original works so you will not find the same things being done elsewhere. We also do our own in-house teacher training using our own syllabus so what is imparted to your child is truly a unique experience that comes with the Mini Monsters pawprint! Since the first language in Singapore is English, do you feel post-millennial kids are lacking greatly in their mother-tongue; be it Bahasa Melayu, Tamil or Mandarin? This will always be a constant uphill battle for anybody teaching and advocating the use of mother tongue in Singapore. When you put a language as the first language and associate it with the language of choice for work and commerce, naturally you will diminish the use of the other languages, in this case, the mother tongue languages. Unlike during our times where we went to school to learn English, the post-Millenials are going to school to learn mother tongue! Most of them come from English-speaking homes and do not see the need to use their mother tongue to communicate other than in the classrooms during the MTL period. In this sense, the post-millennials are making us unique. Technically, your mother tongue is the language you use most comfortably at home and grows from the home. But this is almost absent today with this new generation. We are looking at a new Singapore, where English becomes the mother tongue and the “real” mother tongue needs to be taught! They are bilingual yes, but are they effectively bilingual? It’s quite sad really because the ability to master your mother tongue and master it well is such an asset. You appreciate a community better when you are able to understand its soul by understanding the language. It strengthens your identity as a person and makes you very attractive when you are able to switch languages confidently in your communication with different people in society. More so for the Malay language. It is the national language of Singapore. Meaning, it stands equal with the other national symbols like the national flag, the national flower Vanda Miss Joaquim and the national icon – Merlion. If the youngsters are aware of the other symbols, why not the language? This awareness must be awakened simply because as an island state, Singapore exists, in the larger context of things, within the Malay archipelago. Surely, at some point in our lives, we cannot avoid using the Malay language, properly, to communicate when we travel for work and business within this region. That is also the reason why Mini Monsters have started offering Malay programmes for non-Malay children in the last couple of years as part of our effort to push for better integration between the people. In terms of branding and marketing, what have your strategies been? Staying focused on our vision and fully understanding WHY we exist as well as consistently working with the right industry partners have been our key to successful branding. We set ourselves apart by consciously being unique in the way we present our programmes and in creating our content. Our materials are developed with the end users in mind, the real challenges that are facing them as learners of the language in this present time; not on our own idealistic preconceived ideas of how we think the Malay language should be preserved in a multilingual Singapore. We do not deny that we are bilingual. We can all speak English very well, but we also come with a very clear strategy of placing our dominant capability in the forefront – our mastery of the Malay language. Today, Mini Monsters is the go-to company of choice amongst schools and various government organisations in Singapore seeking quality programmes, Malay books and educational resources for their individual needs. Technology plays a part too. Having good content on social media like FB and Instagram ensures the public is always updated and in the know about Mini Monsters’ latest offerings. In addition, being a public figure whom the community is familiar with, I am blessed with a strong and credible media presence that helps to push the Mini Monsters branding. For 2019, to mark our foray into Monstars TV and Mini Uni and in celebrating our 10th anniversary, I decided to re-brand the company and created monster cartoon versions of myself and my key personnel on our name cards as well as all our social media postings. We each have a ‘monster title’ alongside our formal job titles so people are clear about how our personalities make us the person in charge of that portfolio. Children, parents and teachers love this characterisation that they see on our postings. They see us as fun people churning out fun creative things because we are happy to be the living ‘monsters’ in this company! Any plans of expansion outside Singapore? All our programmes and learning materials are on plug-and-go mode. We are ready to expand and always looking for opportunities to do so. Anything you wish to share with the readers? It is important to tailor-make Malay creative content to appeal to the Singaporean Malay sensibility. Our children are uniquely similar but considerably different from the Malays in this region. They need to be understood in that context. And we need to consistently produce materials that assist those needs. A buoyant community needs buoyant content. I can confidently say today that Mini Monsters has been successful in making that change and thankfully the change has been good! So now we have something on our end to exchange and show to our other neighbours in the region and perhaps someday, the world. I have not gone for any formal business courses in my life and neither did I inherit this company. It has been about staying resilient, not giving up and putting in sheer hard work. So on a business front, Mini Monsters is the first generation, fully conceived and seeded in Singapore, SME. 100% local and proud of it! Easy. Call us up at +65 6258 0346 or you can also visit our website here at minimonsters.com.sg. We are active on Instagram and Facebook too! What Marketing Trends Will Shape Malaysia In 2019?